Question from the Field: What Are Your Shipping Container Structure Manufacturing Facilities Like? We are often asked by our clients and prospects, what are your facilities like? What kind of production facility do you have? We love this question. 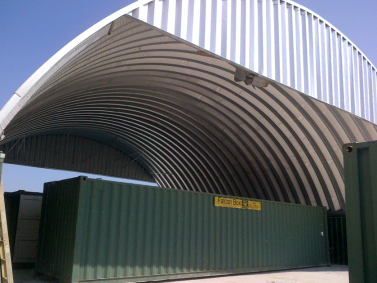 Our 51-acre facility houses our administrative offices, fabrication domes, staging and storage areas for our modified shipping container-based structure inventory. With the development of our container-based structure, we put ourselves literally on the Texas map as the 1st of its kind. Our 2,500 square foot mobile office building is assembled from eight repurposed shipping containers with five on the first floor and three on the second floor. The interior includes reception and waiting area, conference rooms, restroom facilities and private offices with individual windows and doors. Our “Domes”, as we like to call them, are also located on Area 51. These domes are covered structures with concrete floors supported by shipping containers on either side of the metal roof. Our fabrication and modification processes all take place right here at our facility inside these Domes. All container modification features are done at our headquarters property with our experienced staff of welders, painters and other craftsmen. The addition of insulation, electrical, interior and exterior painting and climate control units are just a few of the modifications that are done at our facility. If you are near our facility just outside of Austin, we would love to give you a tour and show you Area 51. 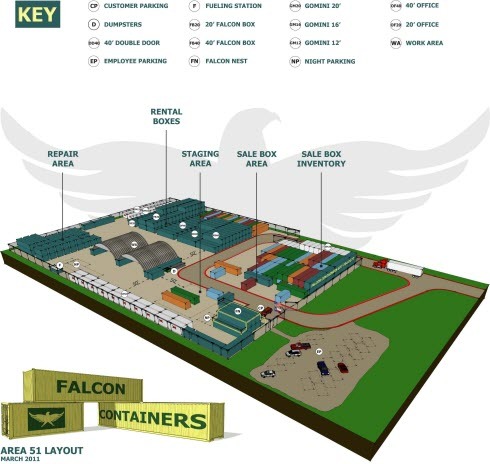 Falcon’s headquarters are located at 7717 Gilbert Road, Manor, Texas, at the intersection of Texas State Highway 130(SH130) and FM 973. The facility is less than 8 miles from the Austin-Bergstrom International Airport. We hope to see you if you are in the area. For our out of town clients, you can refer to our website for a description and images.